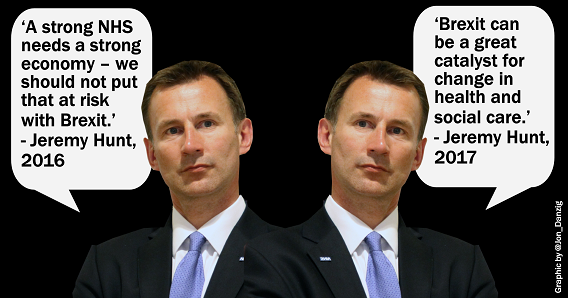 The Secretary of State for Health, the Right Honourable Jeremy Hunt, MP, will see you now. Hello Mr Hunt, the EU referendum is coming up, and I’m very interested to know your view of how Brexit will affect the National Health Service. So, you don’t think we should leave the European Union? “I want Britain’s voice to be strong in the world and believe we will be better off and more secure by remaining in the European Union. So you definitely think leaving is a bad idea? “Leaving the EU would be the biggest loss of British power and influence since the Suez crisis. Both we and the rest of the world would be the poorer for it - and those who do not share our values would rejoice. “Not one reputable independent economic forecaster thinks it will be anything other than negative - possibly tipping us into a Brexit recession meaning thousands could lose their jobs and the government would have less money to spend on public services like the NHS." Thank you Mr Hunt, that’s very helpful and very clear. The Secretary of State, the Right Honourable Jeremy Hunt, MP, will see you now. Hello again, Mr Hunt. Well, the referendum was just two days ago, and I’m sure you’re disappointed that Brexit won. What do you think we should do? “We need to negotiate a deal and put it to the British people, either in a referendum or through the Conservative manifesto at a fresh general election." So, what kind of deal do you think Britain should aim for? What about citizens from the rest of the EU already living here, you want them to have full permanent residence granted to them all? Thank you Mr Hunt, that’s most helpful, and very clear. Hi Mr Hunt, it’s the start of 2017. Happy New Year! What’s your view of Brexit now? Oh. Ok. Thank you, er, Mr Hunt. Good morning Mr Hunt. Nice sunny day for March, isn’t it? I just wanted to check, because when I popped in to see you after the referendum last year, you wanted EU citizens here to have the right to stay. What’s your view now about EU staff working for the NHS, should they be given guarantees? Hello Mr, Hunt. Remember me? Well, it’s almost a year since the EU referendum, and now we have a snap General Election coming up. What will happen if we don’t get a good Brexit deal? “If we get a bad Brexit outcome that would be a disaster for the NHS. Mr Hunt, can I call you a doctor? No, I mean can I get you a doctor, can I call a doctor for you? Because you seem completely confused. Less than one year ago, you were strongly against Brexit, saying it would represent a huge loss of power, wealth and influence for Britain. Then after the referendum, you said Britain should stay in the EU Single Market, and that the British people should have a vote on the final Brexit deal, and that EU citizens living here should be given the guaranteed right to stay. Now, you say Brexit could see Britain’s economy go from strength to strength; you no longer support Britain staying in the Single Market; you’ve changed your mind about another referendum, and you refuse to say whether EU citizens here should have the right to stay. You seem to have caught Brexititus Mr Hunt – currently very contagious among Tory ex-Remainers. You’ve ended up as The Secretary in a State over Health. • Note: Everything above the four dots are direct quotes by Mr Jeremy Hunt. Jeremy Hunt's quotes below the four dots are imaginative conjecture - but the criticism of his changing positions are valid and need to be addressed.